Here’s another drill to help you achieve correct arm and hand rotation through the golf ball. 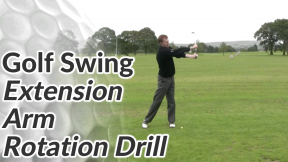 If you haven’t seen it already, you might want to watch the extension and rotation lesson before working with this drill. You can also try this arm rotation drill, which compliments the drill below. Grip the club as normal (a mid-iron is a good club to begin with) but hold it out in front of you so that it’s horizontal to the ground. 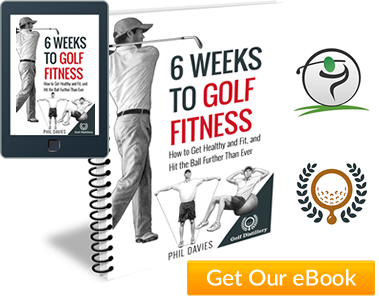 Make a baseball-type backswing and make some full swings around your body – all the while keeping the club parallel to the ground. As the club reaches a point directly in front of your chest, stop your swing and notice at what angle the club head is pointing. We want the toe of the club to point directly up at the sky. 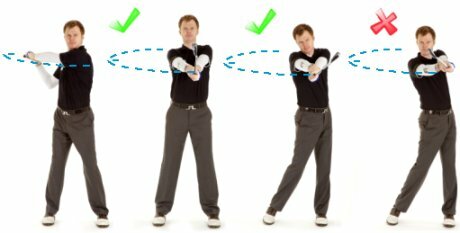 Notice how, from the backswing to the follow through, your right and left hands swap positions (in the backswing your left hand is on top, in the follow through your right hand is on top). If you tend to slice the ball, try to make the toe of the club point to the sky before it reaches the centre of your chest. By the time it reaches the centre of your chest, the toe should have gone past vertical. 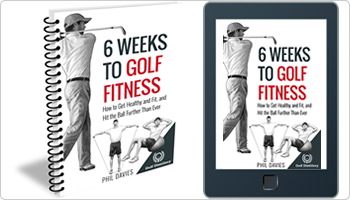 Finally, make a continuous series of horizontal baseball swings and as you do, gradually bend at the hips to lower the club towards the ground. As you lower the club into a position that looks more like a golf swing, remember to focus on that feeling of rotating the hands to get the club square (or past square) at impact.